You might presume, or at least hope, that humans are better at understanding fellow humans than machines are. But a new MIT study suggests an algorithm can predict someone’s behavior faster and more reliably than humans can. Max Kanter, a master’s student in computer science at MIT, and his advisor, Kalyan Veeramachaneni, a research scientist at MIT’s computer science and artificial intelligence laboratory, created the Data Science Machine to search for patterns and choose which variables are the most relevant. Their paper on the project results (pdf) will be presented at the IEEE Data Science and Advanced Analytics conference in Paris this week. The Data Science Machine performed well in this competition. It was also successful in two other competitions, one in which participants had to predict whether a crowd-funded project would be considered “exciting” and another if a customer would become a repeat buyer. Article Disclaimer: This article was published by QUARTZ based on a research published by MIT and was retrieved on 10/19/2015 and posted here at INDESEEM for educational and information purposes only. The views, opinions, thoughts, and research findings are those of the authors on this article. This visual guide builds on the work of SAS JMP Pro 12 Response Screening Linear Fit Model Platform. Response screening is a vital component in statistical and predictive analytics. It is very important to conduct response screening to understand the effects of each factor or input variables on the response or predicted variables. If you are working with huge datasets, response screening cut back the time it would require you to conduct other statistical tests, such as, Bivariate, ANOVA, MONOVA, etc to test the effects of each input variable to the response. 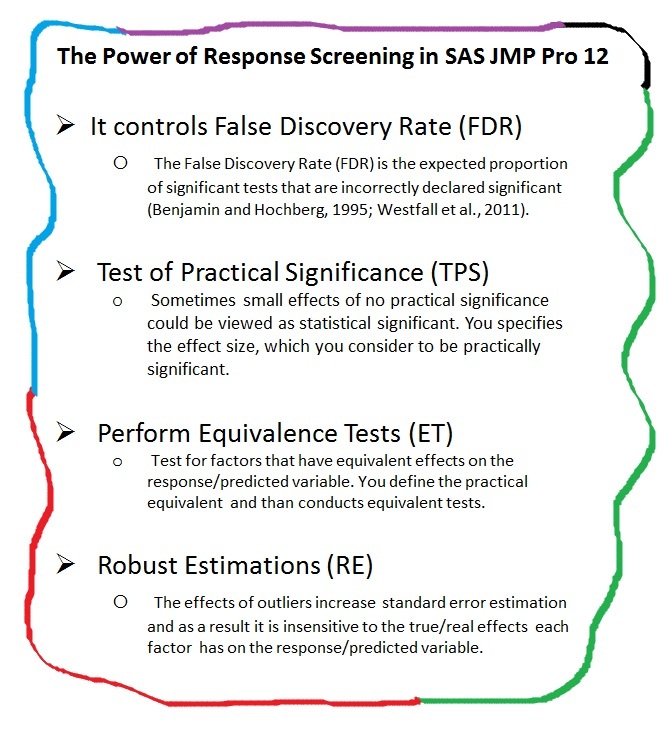 SAS JMP Pro 12 has a very useful response screening platform. Your results are tabulated as well as presented in graphical forms along with all the essential statistics to make the right call. For more information on how to conduct response screening analysis in JMP, please visit this link: Response Screening Platform.